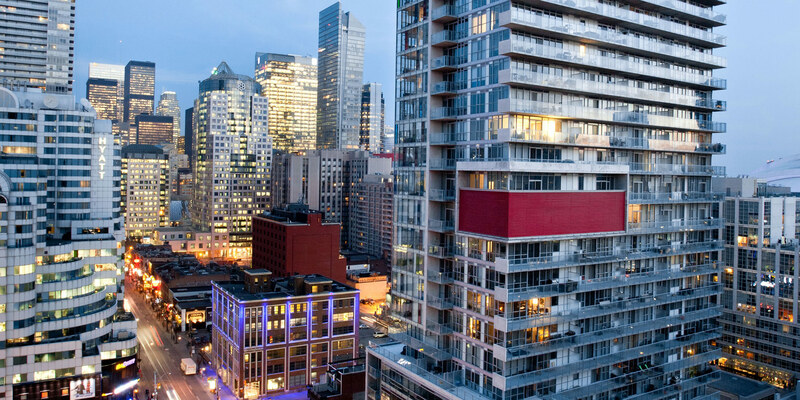 Situated in Toronto’s historic King West district at King and Spadina, TAS DesignBuild’s M5V is a spectacular, innovative, jewel of a building, soaring into the city skyline with views of downtown Toronto and Lake Ontario. Created as a model of sustainability, this is a building of high ideals where design and contemporary urban philosophy unite in a luxurious example of modern living. A slender tower designed by Core Architects, TAS DesignBuild’s M5V is characterized by the juxtaposition of two masses sliding past each other. On the King Street facade: a wall of coloured glass acts as a curtain to the building. Adding to its unique profile, Private Terraces reach out beyond the structure, providing panoramic views of the whole city. Additional interest comes from the vibrant red box at mid-point that marks out the innovative position of the mechanical room – a feature that enhances the building’s commitment to sustainable design and development. TAS DesignBuild’s M5V settles into a neighbourhood that over the past few years has seen a wide range of development. These changes, inspired in part by the boutique hotels and restaurants, are now maturing and providing a growing sense of community. A sophisticated residential neighbourhood in the making, TAS DesignBuild’s M5V is fortunate to have found a unique location on King Street. With an architectural diversity that includes modern high-rises and retrofitted warehouse buildings, King and Spadina has an urban atmosphere eclectic enough to suit everyone. TAS DesignBuild designed M5V to create a soothing imprint. With its gated entrance and landscaped courtyard, it elegantly introduces a new development that can only enhance the community of M5V – Toronto’s most vibrant neighbourhood. The vibrancy, livability and enjoyment of a building comes from space being positively used in a well-planned highly designed way. TAS Designbuild planned M5V for a mix of space including a range of suites to call home, a breadth of amenities and a two-storey retail space that will bring energy and interaction to the building while serving residents’ needs. The ambience of TAS DesignBuild’s M5V is wonderfully eclectic, a blend of contemporary and French classical interior finishes, the exterior a combination of sustainable and high-design exterior finishes. TAS DesignBuild designed M5V as a sustainable building. This means when it comes to energy conservation, greenhouse gas reduction, eco-friendly materials and sustainability, TAS DesignBuild is a highly committed leader in sustainable design. TAS DesignBuild’s green view is manifested in the design. A key feature of the building, and one of the sustainable features, is the 6′ deep Private Terraces that are specially designed to help keep apartments cool in the summer. Generously sized, they also provide spacious outdoor living areas. The sustainable nature of M5V is built to enhance the grace of its architecture. From the mechanical room at its mid-point, to its 6′ deep Private Terraces, each serve their purpose with a eye-catching elegance that only adds to the building’s overall dynamics. If the environment influences the way you lead your life, then TAS DesignBuild’s M5V provides you with the sustainable features you desire. TAS DesignBuild believes people need living room. Our suites – with a broad choice of layouts and options to combine – are designed to maximize living space and upgrade the quality and function of your life. TAS DesignBuild has taken into consideration how things are stored and how space is utilized. We brought real living into the design and make it possible to customize your own suite through our three customization options – Essential Design™, Design By Passion™ and Tailor Fit™.